Everybody seems to be getting a touch-screen phone these days. They are generally able to make calls, browse the web, play games and more. In my case, I have an iPhone, and I primarily use it to read my email, check my calendar, read facebook or browse the web. I have lots of free games, but hadn’t found any games that really engaged me. 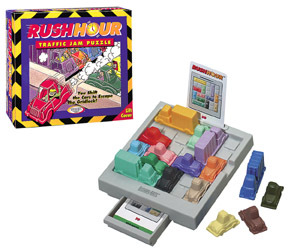 Rush Hour is a simple puzzle game that I have seen for years in toy stores and game shops. 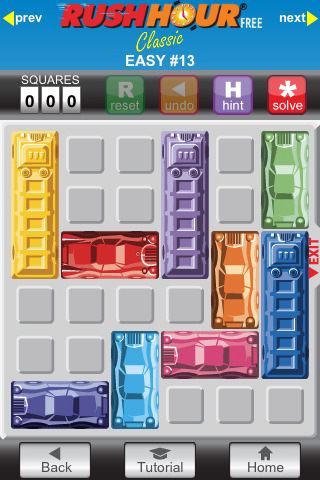 It has a simple premise, you need to solve challenges where you arrange the plastic cars on a grid as indicated on the challenge card. Then, by only moving the cars forward and back, you need to free a path for the red car to slide out of the traffic jam. It’s basically a 2d mashup of a Rubik’s cube and Tangrams. It’s deceptively simple to learn, but the trickiest challenges take some time. I realized this would be a great iPhone game right when I got the phone and tried an assortment of free games. Many were fun, but very few kept me engaged for more than a few minutes. Rush Hour seemed an obvious game for the touchscreen device, but when I looked, it wasn’t available. Thankfully, they have realized the opportunity and made this time killer available for the Phone. A free version offers a couple hours of enjoyment, and the pay version promises many more challenges. I like how the game tracks your movements and you can try to solve the puzzle with the fewest movements if you like. Phone adaptations of more complicated games I enjoy such as Settlers of Catan enver made any sense to me, I don’t play board games to have a private experience on a small screen, I play to have a fun time with friends. Games for the phone should be easy to pick up, easy to stop anytime and fun. Rush Hour has met all of these goals. It makes bathroom time and time spent waiting around much more fun! Previous story The three habits of highly effective tomatoes. Have you tried “Unblock Me”? It looks similar to me, but without the car theme. Also “Fling” has a similar set of logic and can drive you crazy and keep you occupied.